The body has many different warning signs to alert you when something is wrong. Some of these signs may unexpectedly link to certain body parts. For instance, a lingering discomfort in one of your limbs might signal organ damage elsewhere in the body. This is the case when you are dealing with asterixis. In this article, we are going to examine all things related to asterixis. From asterixis definition, to asterixis causes, to asterixis diagnosis, we will cover the basics about this curious symptom, as well as what asterixis treatments are available to you. 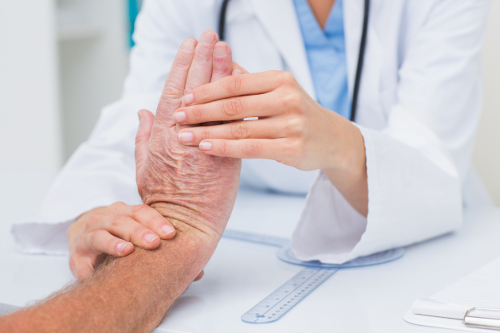 So, the first question you may have—especially if you’ve never heard of it before—is, “What is asterixis?” Essentially, it’s the involuntary movement of the hand and wrist when your arm is extended. It tends to affect both hands, though it sometimes affects one in particular. This movement commonly resembles a bit of a flapping motion, so it often is referred to as a “flapping tremor.” The tremor is involuntary, and usually appears if the arms are extended with your hands up (in a “stop” gesture) and pressure is applied to push them back. Involuntary tremors are never a good sign of anything when it comes to your body, and unfortunately, this condition is no different. Involuntary tremors usually indicate an internal malfunction that is serious enough for your brain to get jumbled messages to do things. This is what happens when you suffer from asterixis. Beyond these causes, there are also a number of medications that can cause this condition to develop. Medications and substances like alcohol, barbiturates, lithium, carbamazepine, phenytoin, valproate, gabapentin, ceftazidime and metoclopramide. If you are at risk for any of these diseases or take any of these drugs/medications, it’s good to know the symptoms of the condition. What Are the Symptoms of Asterixis? The symptoms of this condition are pretty easy to recognize: involuntary flapping movements in the hands when extended. Sometimes a little pressure is applied to start the movement; other times it isn’t necessary at all. In addition to this, you may experience other jerky, wrist-joint movements; joint and muscle pain; weakness in the arms; and a motor disturbance in the jaw, tongue, neck, eyelids, and arms. This is on top of many of the symptoms that may come with the underlying cause. The risk factors are pretty easy to understand. Those who drink alcohol excessively are prime candidates, as well as those with existing brain or systemic disorders. Cardiac, kidney, and respiratory diseases may also put you at a higher risk for the condition. The use of the drugs we mentioned previously is also a risk factor. The process of diagnosing this condition is like most diagnoses and examinations. The doctor will ask to discuss your medical history, making note of any brain or liver damage you may have incurred in the past. This will be followed by a physical exam. The physical examination involves the patient extending their arms, spreading the fingers, and then flexing at the wrist. If the tremors aren’t immediately present, the doctor may add pressure on the wrists to see if that activates the tremors. If the tremors appear in either test, the patient will probably be sent for more medical tests that may include CT scans, blood work, and nerve condition studies. These tests are usually to try and figure out what the underlying problem is that is causing it. Unfortunately, treatment for asterixis all depends on what is causing it in the first place and how much damage the underlying cause has done. It could be something relatively easy like switching medications to a less powerful type. But in the case of something like brain injury or liver failure, it really depends on whether the issue can be fixed or how much of the issue can be treated at all. If You Think You Have Asterixis, Go See a Doctor! As much as we would like to see simple, natural solutions for all of life’s medical issues, asterixis should be checked out by a doctor. As you have read above, some of the causes are minor and are easily treatable. Others may take a lot of time and work. For others still, you may not be able to do anything at all. Regardless, you must remember that it is a symptom of a bigger issue. And the sooner you respond to your symptoms, the sooner you can get a full diagnosis of your medical issues and, hopefully, have time to set them right. “Definitions for Asterixis,” Definitions.net, http://www.definitions.net/definition/asterixis, last accessed June 26, 2017. Kerkar, P., “What is Asterixis, Know its Causes, Symptoms, Treatment, Pathophysiology, Risk Factors,” ePain Assist, May 2, 2017, https://www.epainassist.com/movement-disorders/what-is-asterixis, last accessed June 26, 2017. “Asterixis,” Medigoo, https://www.medigoo.com/articles/asterixis/, last accessed June 26, 2017.